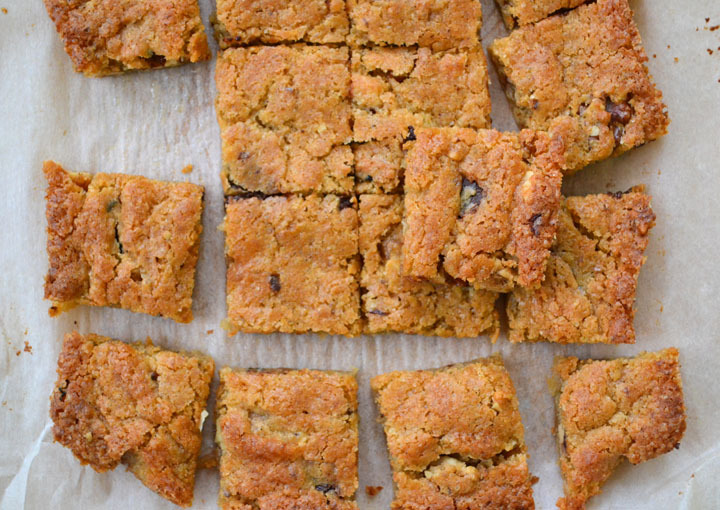 I love a good chewy bar, like a brownie only without the chocolate – these are essentially blondies, rich with butter and brown sugar, which acts as a blank canvas you could add anything to. 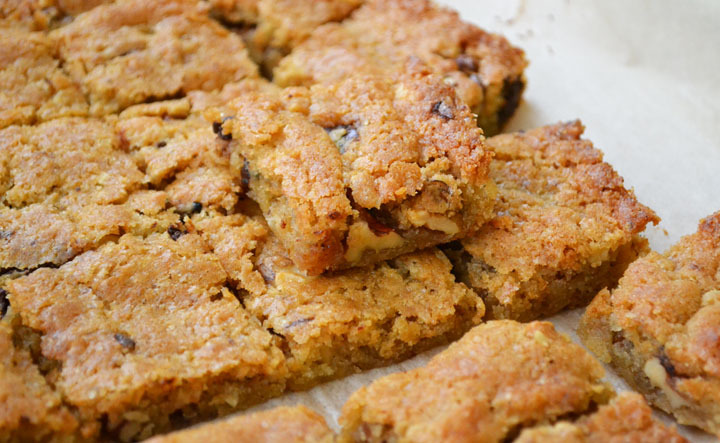 These are made with crunchy nuts and chewy dates, which are a winning combination. Soft Medjool dates are most often found in the produce department of the grocery store, and have pits that are easy to remove, but mean they stay soft, unlike the hard bricks of dates you so often find in the baking section. In a medium bowl, melt the butter in the microwave. Stir in the brown sugar, egg and vanilla. Add the flour, baking powder and salt and mix until almost combined; add the nuts, dates and chocolate and stir just until blended. Spread into a parchment-lined 8×8-inch pan and bake for 25 minutes, until golden and starting to pull away at the edges. Cut into squares or bars while still warm. Posted in Recipes, Desserts and tagged snacks, Squares, Cookies, desserts.